Gregan and Denny – 400m finalists. Thomas Barr in the 400m hurdles, Marcus Lawler 200m and Brian Gregan 400m all won their heats at the opening day of the European Clubs Team Championships in Vaasa Finland today. All five big names came through in the 400m hurdles (see below), which is shaping up to be the race of the competition. In the women’s 100m, Amy Foster finished second in her heat, which was the faster of the two. Others safely through to their finals were Phil Healy 2oom, Sinead Denny 400m and Sarah Lavin 100m hurdles. 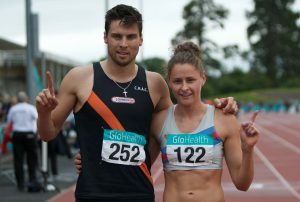 There was disappointment for Ben Reynolds who was disqualified from his 110m hurdles heat and for Christine McMahon who missed out by one place on qualifying as a fastest loser in the women’s 400m hurdles. Tomorrow – first up is Cara Kennedy in the women’s hammer at 11.25am. On the track, Thomas Barr is the first of the Irish in action at 12.47pm. Also scheduled are the women’s 100m final (Amy Foster), women’s 3000m (Shona Heaslip), men’s 1500m (Paul Robinson), women’s 800m (Claire Mooney), both 400m finals (Sinead Denny, Brian Gregan), men’s 5000m (Mark Christie) , women’s steeplechase (Kerry O’Flaherty) and 4x100m relays on the track. In the field, there’s the women’s pole vault (Sarah McKeever) and triple jump (Sarah Buggy) and then the men’s hammer (Dempsey McGuigan), high jump (Ryan Carthy Walsh), shot (Sean Breathnach) and long jump (Adam McMullen) and women’s javelin (Grace Casey) in that order. 100m – Ht 2 1 Mujinga Kambutji (Swi) 11.55, 2 Amy Foster 11.59. Two fastest qualifiers. B 100m: 1 Ciara Neville 11.70…4 Niamh Whelan 11.77. B100: 9 Stephen Gaffney 10.74. 200m – H1 : 1 Marcus Lawler 20.71. Ht 2: 1 David Lima (Por) 20.67, 2 Alex Wilson (Swi) 20.79..
400m – Ht 1: 1 Brian Gregan 46.24, 2 Dylan Borlee (Bel) 46.77. 110H – Ht 1: Ben Reynolds disq. 400H: – Ht 1: 1 Kariem Hussein (Swi) 49.73, 2 Rasmus Magi (Est) 49.92, 3 Karsten Warholm (Swe) 50.256. Ht 2: 1 Thomas Barr 50.49, 2 Yasmani Copello (Tur) 50.61. European Teams: Gregan wins 400m, Foster 2nd 100m, Barr 5th.